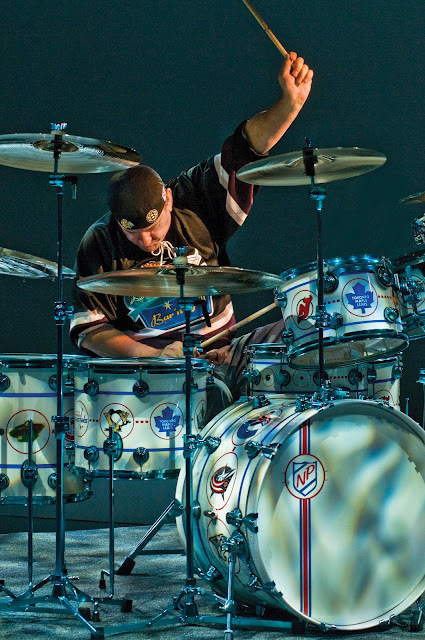 (June 8, 2015– Oxnard, CA) Fans of iconic Canadian rock band Rush will enjoy a once-in-a-lifetime chance to pose for a picture behind legendary drummer Neil Peart’s one-of-a-kind, Collector’s Series® Drum Workshop (DW) hockey-themed drumset on the band’s upcoming R40 Live Anniversary Tour. Highly recognized by hockey fans and Rush fans alike, Peart was featured playing his percussion-focused rendition of The Hockey Theme on the drumset in the opening sequence of hockey telecasts on The Sports Network (TSN) and has been on display in the Hockey Hall of Fame along with the Stanley Cup since 2010. Peart’s iconic drumset will be displayed on the Canadian dates of the R40 tour alongside a signed, limited edition Neil Peart Icon Snare from DW and a signed Sabian cymbal which will both be auctioned on eBay. 100% of the photo donations and auction proceeds will go to The Princess Margaret Cancer Foundation. For a minimum $10.00 donation to The Princess Margaret Cancer Foundation, photo opportunities with Neil Peart’s DW hockey drumset will be available when doors open one hour prior to the start of each show and will be available until the end of the band’s scheduled intermission. A valid concert ticket is required. With more than 45 million records sold worldwide and countless sold-out tours, Rush – Geddy Lee, Alex Lifeson, and Neil Peart – is not only one of the most inventive and compelling groups in rock history, but remains one of the most popular. The RIAA® has certified Rush for the third most consecutive gold/platinum studio albums by a rock band, topped only by the Beatles and the Rolling Stones. Rush’s vast catalogue includes such classics as 1974’s self-titled debut, 1976’s 2112, 1981’s Moving Pictures, 1996’s Test For Echo, and 2002’s Vapor Trails. Rush released their 20th studio album, Clockwork Angels, in 2012 via Anthem/Roadrunner Records. The critically-acclaimed collection marks their first studio recording since 2007’s Snakes & Arrows, and debuted at #1 in Canada and #2 on the Billboard 200, matching the highest chart debut of the band’s career. In addition to their commercial success, Rush has also been recognized with a number of Juno Awards and multiple Grammy® nominations, including one for the acclaimed documentary “Rush: Beyond The Lighted Stage” and the Allan Waters Humanitarian Award. Enjoying a pop culture renaissance, Rush made a rare television appearance - their first in over 30 years - on Comedy Central’s “The Colbert Report” and a memorable cameo in the film “I Love You, Man.” In 2013 Rush was inducted into the Rock and Roll Hall of Fame to the delight of fans around the world. During the successful Clockwork Angels tour, The Globe & Mail hailed Rush as “one of the few bands anywhere that just keeps getting better” while a career-chronicling Rolling Stone feature summed up the renowned rock trio’s continuing artistic vitality by observing, “It’s true that Rush doesn’t mean today what it did in ’76 or even ’96. It may mean more.” Rush will celebrate their 40th anniversary with their last large-scale tour, R40, visiting 34 cities in North America starting in May 2015 including sold out dates in Austin, San Jose, New York, Toronto, Philadelphia, Boston, Chicago and ends in Los Angeles at The Forum on August 1, 2015.